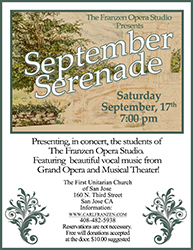 The Franzen Opera Studio provides an opportunity for developing artists to grow by trying out répértoire in a concert series featuring the students of Carl Franzen's Vocal Studio. The performances include selections from Grand Opera, Operetta, Classic Musical Theater and the Concert Stage. We are honored to showcase our renowned concert pianist, Dmitriy Cogen, at all of our concerts. Opera, Operetta, & Musical Theater! Free will donations at the door.